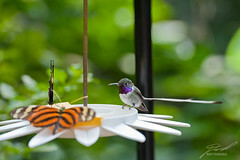 I was told this was the smallest of the North American hummingbird, which would make this the Black-chinned Hummingbird. It was incredibly tiny and very interesting to watch. He apparently doesn't usually play nice with the butterflies at the feeder though so this was a rare treat in the Detroit Zoo's butterfly house.